Many of us have plans to bring our kids to visit their grandparents sometime during the summer. Sometimes it can be challenging to bridge the generation gap and figure out what to do together, particularly if the two generations haven't had much face time, whether due to distance or other factors. Here are 10 activities to help break the ice and help grandparents and kids enjoy quality time together and develop strong intergenerational bonds. 1. Read together. Even the shyest kids have trouble resisting the offer of a cuddle and a favorite book. Books are a great activity at home and also open the door for library and bookstore adventures. If grandparents live far away, try a story over the phone. 2. Share a favorite craft. Does grandma or grandpa love knitting, woodworking, or calligraphy? Whatever the craft, have them share it with your kids. Not only will it create a fun activity and opportunity for grandparent to be teacher, but the finished product can serve as a memento of the visit for years to come. 3. Share a secret recipe. Baking and cooking together is fun and productive. Older kids will especially love if grandma or grandpa shares a secret family recipe (that they've been withholding from you all these years)! 4. Make music. Whether it's singing together, banging on the piano, or busting it out on kazoos, music is a universal language across generations. 5. Get outside. 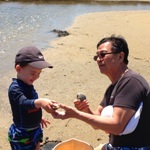 There are so many outdoor activities that kids and grandparents can enjoy together, such as gardening, fishing, or a personal favorite in our family, clam digging. It's even better if they can enjoy the fruits of their labor together afterwards. 6.Share family stories. Visiting grandparents gives kids the opportunity to learn about their family history, or at least hear about what their parents were like as kids. Looking at old family photographs can make it even more enjoyable (and often humorous). 7. Learn a new language (if applicable). Encourage bilingual grandparents to teach your child their mother tongue (my parents can teach my son Cantonese far better than I ever could and without my American accent). Or if both parties are feeling ambitious, grandparents and grandkids could try learning a new foreign language together. 8. Have your child show the grandparents around. Older kids may enjoy playing tour guide, whether it's a walk around the neighborhood (nearby parks are a good destination) or up to town center. 9. Tackle chores together. Chores can take on a fun new dimension when it's not the parents delegating, whether it's going grocery shopping, doing some light yard work, refilling birdfeeders, or some other task. 10. Get social. Older kids can help get grandparents up to speed with computers and various forms of social media so it's easier to keep in touch. Learn to Skype or record and share video or audio clips. 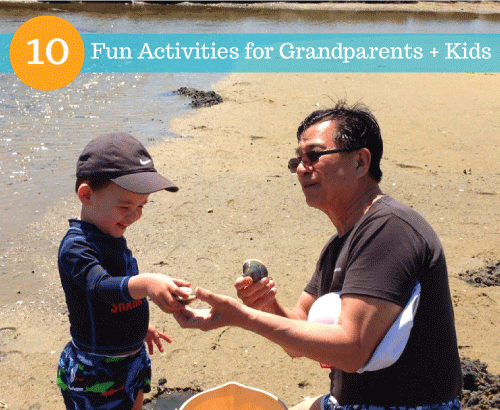 Do you have other ideas for grandparent-grandchild bonding! We'd love to hear them in the comments below!